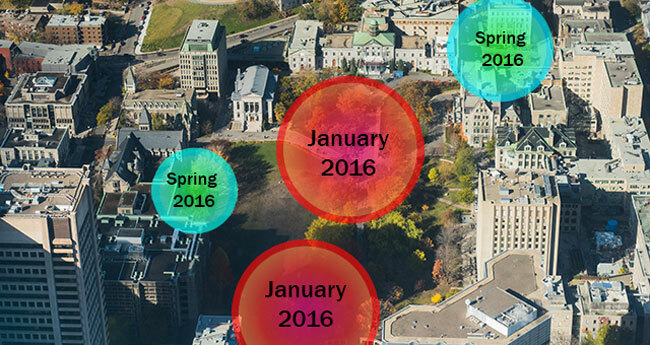 Starting this January, McGill IT Services will begin providing WiFi to outdoor areas on campus. Initially, two areas will be covered: the Roddick Gates and the crossroads between the main entry road and the road in front of the Three Bares statue. Another two areas will be covered in the spring: Redpath terrace and the James Sculpture Garden / James Square. When McGill began providing wireless network service back in 2002, it was available in just a few buildings. Over the following 3-5 years coverage increased steadily to include all buildings on both Downtown and Macdonald campuses. Now we’re poised to take the next leap forward by providing WiFi to outdoor areas on campus. The technology was put to the test on Nov. 7, during an emergency simulation exercise, conducted by McGill Campus Public Safety, Montreal Police (SPVM) and Urgences Santé. For the event temporary wireless access points were installed at five locations on lower campus. The outdoor WiFi allowed a crew of videographers to stream the simulation from their iPhones to a room in Leacock Hall, where safety responders, members of senior administration and others were able to see, in real-time, how McGill’s response to an active shooter would unfold. The safety simulation test gave the Network Infrastructure team valuable data in order for them to make final adjustments to the service and begin delivering the service to the downtown campus in January. Additionally, he said each wireless access point still needs to be wired to the main network, which poses challenges outdoors. Copper Ethernet cables are limited to 100 meters which is easily surpassed outdoors. Special infrastructure needs to be added, underground conduits need to be identified and in some cases the ground will need to be dug up to run the fiber-optic and copper cabling. Where, when and how will you be able to use it? Starting in mid-January, two access points will be set up: one near the Roddick Gates and another at the crossroads between the main entry road and the road in front of the Three Bares Statue. Another two access points will be added in the spring, to cover the Redpath terrace and the James Sculpture Garden / James Square. The selection of these locations was based on feedback from students, faculty and staff during a data gathering effort in October 2014. Over the past couple of years IT Services has actually been providing temporary WiFi service during FROSH week to student societies that set up booths in the area in front of the Three Bares. The outdoor WiFi service will be an extension of existing campus WiFi, so once you’re connected there’s no additional configuration needed, and your connectivity should be seamless as your move around the campus within the covered zones (see the illustrated map). Note that there are two frequencies for WiFi: 2.4 GHz and 5 GHz. Testing has shown that users experience a clearer, faster signal at the 5 GHz frequency, due to the higher bandwidth and less interference from extraneous downtown signals. For these reasons, we recommend using devices that support the 5 GHz frequency. If you’re buying new equipment look for “5 GHz”, “802.11ac”, or “Wireless AC” in the manufacturer’s specifications. Wireless statistics show that approximately 45 per cent of devices used at McGill are currently using 5 GHz. These include Apple iPhone 5 and higher and most Android devices purchased after 2012; older mobile devices can be used, but only support 2.4 GHz. IT Services is looking forward to your feedback on the service once it’s made available. We will analyze usage in the spring/summer in order to plan for more outdoor wireless coverage. Watch for upcoming announcements about where to send your comments. How about improving the wifi indoors before expanding it outdoors! I work almost everyday in the Redpath library! I couldn’t even download a paper today (December 8th)! It was the case for Bronfman as well! Also, the internet in my office in the library comes and goes from time to time!